The Utah Republican Party lost a big legal battle Tuesday in its attempt to overturn a 2014 Utah election law that allows candidates to qualify for the ballot through the caucus-convention system and/or by collecting signatures. Republicans had argued that the law interfered with the party’s constitutional right of association to select nominees as it chooses — and it preferred to use only the traditional caucus-convention system. It concludes, “Not only does this balance not offend our Constitution, it is at its very essence. Accordingly, we affirm” earlier decisions that upheld the new law. Utah Republican Party Chairman Rob Anderson said the party is reviewing the decision and will meet in coming days to decide whether to appeal further. “We want to get through our caucus meetings today first,” he said — noting those meetings coincidentally came on the same day as the decision. Don Guymon, who is among conservatives on the GOP State Central Committee who have fought to repeal SB54, said the party’s Constitutional Defense Committee will conduct a thorough review to decide what to do next. Other options, he said, include pushing the Legislature to repeal SB54 or doing that by passing the Keep My Voice initiative — which is seeking to qualify for the ballot. “We encourage all Republicans who want to preserve their First Amendment rights to sign the Keep My Voice initiative,” Guymon said. Meanwhile Alex Cragun, executive director of the Utah Democratic Party, questioned what Republicans will do now with a bylaw forced through by ultraconservatives to expel candidates in some races who gather signatures. (Anderson said earlier he is ignoring it as illegal). SB54 was a compromise negotiated by the Legislature to preserve the caucus-convention system in the face of a 2014 ballot initiative that would have scrapped it for a direct primary. The resulting law allows both the convention and signature-gathering paths to the primary ballot. As it turns out, that dual path was a key point in the court’s decision to uphold the law. 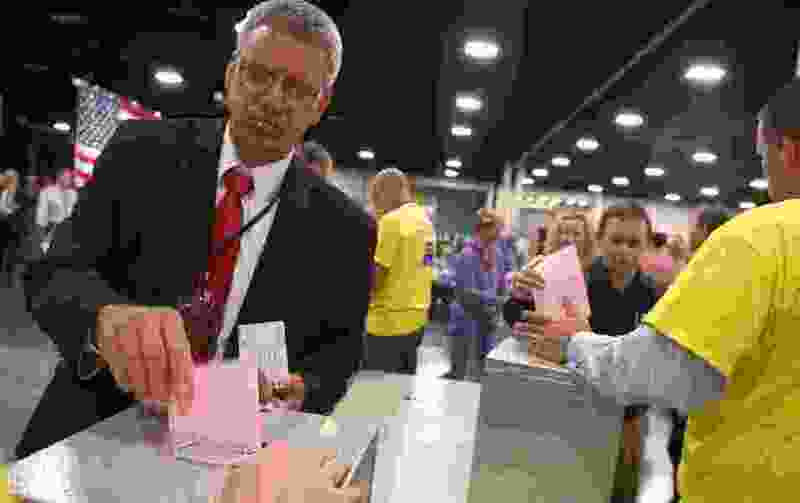 The Republican Party had argued the signature-gathering requirements were too burdensome, especially in some legislative districts that are packed with members of one major party with few members of the other. That burden effectively interfered with the party’s right of association with potential candidates, according to the GOP. “If the signature-gathering path stood alone, we would be inclined to agree,” judges wrote. Of note, the new Count My Vote initiative — which may appear on the ballot this November — seeks to lower the number of signatures required by law. It would also cement into law the dual pathway to the ballot. The Republican Party arguments against SB54 convinced one of the three 10th Circuit judges in the case. Utah’s official reasons for imposing the hybrid nominating system “are vague and even impermissible,” Tymkovich wrote. Tymkovich was appointed by President George W. Bush. Judge David Ebel, who wrote the opinion for the majority, was a President Ronald Reagan nominee. The third judge, Carlos Lucero, was appointed by President Bill Clinton. Judges used part of the opinion to chide Marcus Mumford, attorney for the Republican Party, for missed deadlines and failure to comply with court orders. The Utah Republican Party had once amassed a $410,000 debt in pursuing the case. It said earlier this year that Dave Bateman, CEO of Entrata software, had agreed to handle the debt by negotiating to lower it and cover the remaining costs.